At the end of World War II, several surplus buildings were decommissioned at the Marine Corps Training Center at Camp Elliott, San Diego. 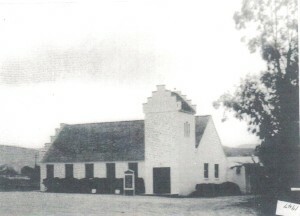 One of these was the Marine Base Chapel which was dismantled and moved to Valley Center where it became the main sanctuary of the Community Church. It was to become the first permanent home for the church, which traces its roots to 1882. A building site with 163-foot frontage and depth of 200 feet was donated by Mrs. Nellie Lamb, and church members began the task of hauling the decommissioned chapel to its new home, then performing much of the finish work. The historic chapel was dedicated on June 8, 1947. The following year, another surplus building from Miramar Naval Air Station was acquired and became the church social hall.